"This jeep started out on a farm as many did then my uncle took it off the farm and used it for his gas station and was also his daily driver for 35 years. 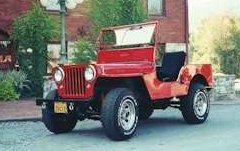 When I got the jeep about 5 years ago it was road-worthy and ran good but I wanted to do a frame up restoration. A good friend and I took the jeep down to the bare frame and I guess you can say we built a new Willys. Everything that moved was fixed or replaced and every piece was sandblasted and painted back to original. The Willys does not get four wheeled any more and has never seen rain. I now show the Willys and have placed in every show the we attend. The judges and spectators just love to look at it and does it ever turn heads when we take it out on nice days for rides. There are still a few things I want to do yet like a roll bar and bikini top and install the spare tire. This Willys has been in the family 52 years and hope it always will." "Turns out that the Jeep is not a rare '49. When Mark forwarded the Serial Number to me I was very surprised. By my calculations it was a 1948, probably sold as a '49. Mark was incredulous, but dug into it himself and was more surprised than me. The Jeep had been in his family since it was purchased in 1949 and everyone just assumed it was one of the rare ones." 1948 or 1949, it's still a fine example of the marque! More photos are available on the Flatfender Gallery.